Well, isn’t this a throwback? 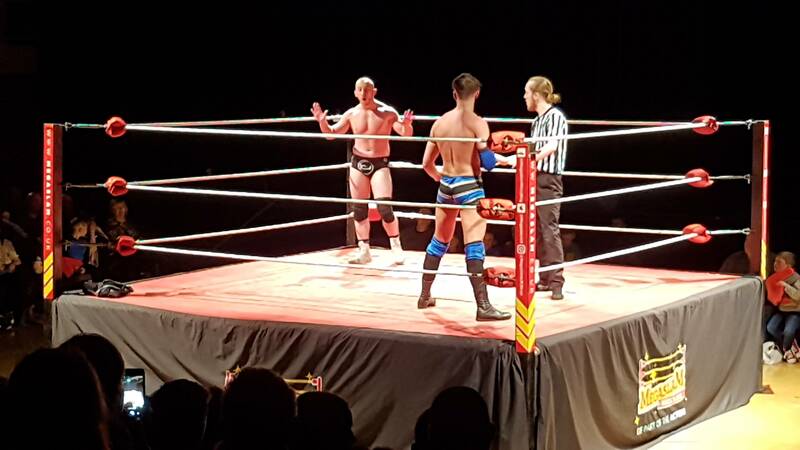 I’ve not been to a family-friendly show at Grimsby Auditorium in nearly two decades, since the days of Brian Dixon’s All-Star Wrestling running the venue what seemed like four times a year. Back then I saw wrestlers such as David Flair, a Scotty Too Hotty lookalike named Too Hotty Scotty (who I thought was the genuine article until the ring announcer refused to say his proper name), PN News, Beyond the Mat era Jake the Snake Roberts, The Dog from WCW, and Tatanka. But I grew wary of the shows specifically when Spiderman wrestled – he spent the match hanging upside down from the ropes and pretending to shoot webs. This cynical fourteen-year old decided it was too childish, so I stuck to Katie Vick and Hot Lesbian Action on Monday Night Raw. The format of these shows hasn’t changed much over the years. Megaslam Wrestling’s debut in Grimsby started with the unseen compere, the voice of God perhaps, telling the crowd how to narc on the bad guys. Then he said how two teams tonight were fighting for total supremacy: Team Nasty (BOOOOOOO) and Team Megaslam (YYYYAAYYYYY). We don’t learn any more about either team – their goals, motivations, etc – so I imagined Team Nasty to be led by a villain like Doctor Claw from Inspector Gadget, who end each conversation with maniacal laughter; while Team Megaslam spend their days cleaning up parks and giving PSAs on the dangers of sniffing glue. Match one was a standard singles contest pitting Team Nasty’s CJ Banks against Team Megaslam’s Joey Hayes (coming out to pre-recession anthem ‘Chelsea Dagger’). I suspect my friends around the Greater Manchester area have seen these two fight countless times in Futureshock and Grand Pro Wrestling, but not in full-on end of the pier mode. Big moves included a test of strength, Banks’ excruciating wristlock, and Hayes’ death-defying ‘baldy’ chant. For the audience it worked perfectly as the kids were enraptured by every hold. So much so, I moved into a bank of empty seats because I kept being decked by foam fingers. The near twenty-minute bout ended when Banks removed the top turnbuckle, and executed a cheeky roll-up after Hayes accidentally bonked his head on the exposed steel. 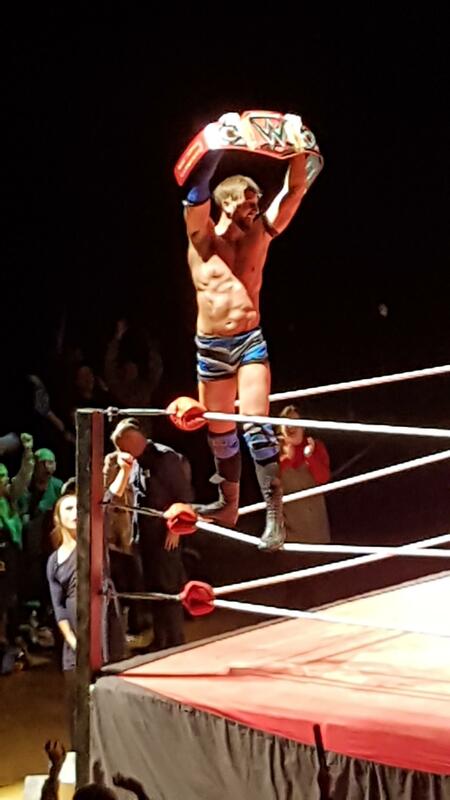 After the match, the compere said Joey Hayes would get his chance at revenge in the main event Rumble. Spoilers, like. Next, a Tag Team Thriller that featured rather familiar combatants as Team Nasty’s ‘VIP’ Reese Ryan and Tom Weaver faced Team Megaslam’s Scotty Rawk and Chuck Wood. This was a complete change of pace, the high-octane moves transplanted straight from #GrimsbyGraps. The different environment particularly suited Reese Ryan, who mugged in his American accent one moment, and shrieked like a bad day at Alton Towers the next. Wood took the brunt of the offense but managed the hot tag to Rawk. Wood’s Attitude Adjustment into Juvi Driver led to Rawk’s frog splash, earning them the victory. The first half ended with the Megaslam Championship title match. Team Nasty’s Robbie McKenzie challenged Team Megaslam’s champion, Danny Hudson. This was the first time I’ve seen (or heard of) McKenzie – imagine Paul Robinson for a family-friendly audience and you’re almost there. Problem here was, Hudson is twice his size, which made any face-in-peril spots somewhat unbelievable. Fair play to McKenzie though, this was an engaging contest, more like the one move a minute style of the opener, and he played his part well. Team Nasty’s Craig West (cracking moustache and mullet combo) interfered and tossed the belt to McKenzie, who successfully clobbered Hudson in the head. Only a two count though. With no more ideas left, Robbie succumbed to Hudson’s superkick. 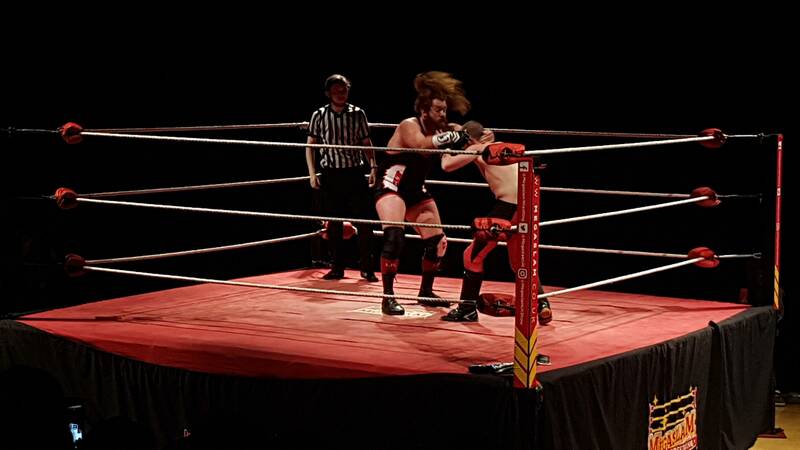 The second-half started with a special Heavyweight Challenge between ‘The Unit’ Mickey Barnes and ‘Action Man’ Stixx. Barnes, like 90% of the wrestlers tonight, came out to AC/DC, because Marvel have proved that licensing their music is cheap as chips now. 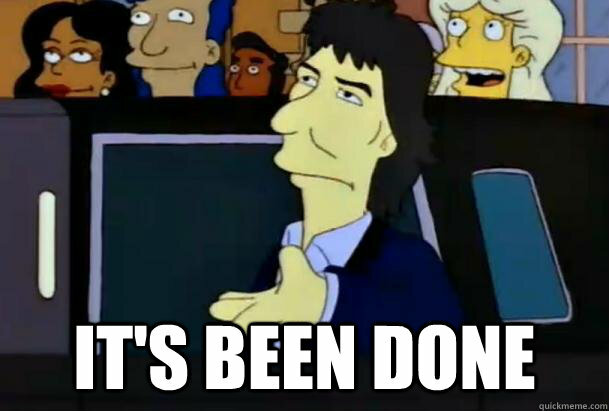 Stixx, meanwhile, used the ITV Gladiators theme. Wrestlers and themes from 90s TV shows? Stixx spent the match struggling to bodyslam Barnes in a Wrestlemania 3-manner. This, to prove we’re far away from inner-city artisan craft graps, resulted in ‘fatty’ chants for Barnes. He couldn’t use his generous supply of padding to his advantage, missing a leg drop. When Stixx tried a sunset flip, Barnes opted to aim a punch instead, smacking nothing but ring canvas. Our ‘Action Man’, once hitting a baseball slide on the outside, achieved his Hogan-esque dreams by slamming the big man. He set up for the spear – missing the first attempt but quickly hitting the reprise for the win. …And evidently won the WWE Universal Championship too. Good job, lad! As a way less cynical 31-year-old (more ‘world weary’ if I’m honest), Megaslam’s show was good fun and a nice change from the workrate-based promotions I gravitate towards on the British scene. Would I even travel to Scunthorpe to watch them? Probably not, but as family-friendly entertainment, you can’t do much better than this. Thanks for reading! In my next column, I will return to the proper #GrimsbyGraps after several months out with a great big recap explaining everything that has happened in British Wrestling Revolution since my last report in August, all ahead of BWR’s ‘King of the Underground: Redux’ on February 15th. Until then, check out my completely unrelated podcast, and keep an eye out for my upcoming other completely unrelated podcast.